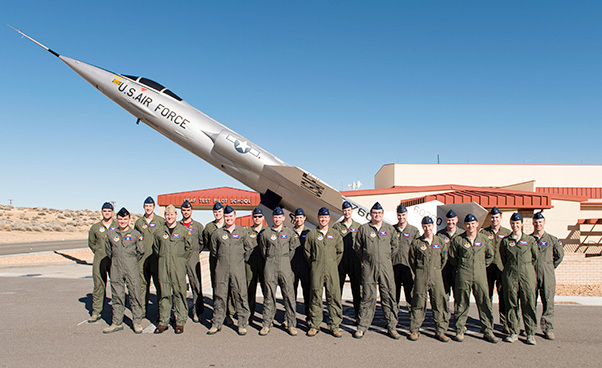 United States Air Force Test Pilot School Class 16A poses in front of the NF-104 display in front of the school house. USAF TPS Class 16A graduated Dec. 9 sending 20 new aviators into the flight test world. Twenty new test pilots, flight test engineers and combat systems officers enter the test world Dec. 9 as Class 16A graduates from the U.S. Air Force Test Pilot School at Edwards Air Force Base, Calif.
Each graduate is awarded a Master of Science in Flight Test Engineering from Air University. The students endured a rigorous schedule where they have to balance intense academics while flying a wide variety of aircraft. Another portion of the 11-month course is the Test Management Program, a six- to eight-month project that gives the students hands-on experience and oversight of a real test program. The graduation requirement serves as a thesis project and authorizes students to be awarded a master’s degree. Four projects were completed by four teams. The titles of the projects were HAVE VISA, HAVE VAPOR, HAVE LIGHT TOO and HAVE SEXTANT. The focus of the projects varied on subjects such as comparing a new targeting system to a current production system; researching a new precision navigation system; evaluating a flight simulator’s qualities; and adaptive flight control testing. These real-world test projects are either solicited from outside agencies or the school can be asked to conduct the projects. The test management projects are relatively inexpensive to the customers due to TPS’s wide range of resources and personnel. 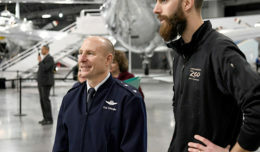 In addition to honoring the graduates, TPS Class 16A will present the David A. Lazerson Outstanding Instructor Flight Test Engineer Award, which is presented to the staff member whose diligence, attention to detail, professionalism and passion for flying set the standard for airborne and control room test conduct instruction. Lazerson was a TPS staff member who is remembered as an exceptional flight test engineer and an excellent pilot. 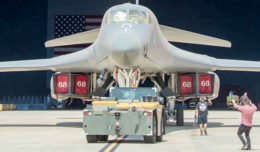 The graduates will now be integrated into teams throughout the flight test enterprise and begin shaping the technology and weapon systems of the future for the Air Force, sister services and allied nations.